More than twenty people attended the protest at ATOS healthcare’s Arden House assessment centre in Newcastle upon Tyne on 28 August. As well as disabled people negatively affected by the decisions of ATOS and members of Disabled People Against Cuts, supporters from a number of local anti-cuts groups including Newcastle Anti Cuts Network, Unite the Resistance and Youth Fight for Jobs and Education attended. A number of people spoke about their personal situations and the negative impact the Work Capability Assessment and the benefits process in general has had on their lives. Others warned about the impact continuing ‘welfare reform’ will have on those who experience mental health problems, and the impact this pressure and income reduction will have on their families and children. While there was criticism of the culture and attitude of ATOS and its management towards benefit claimants, someone made the point that ATOS’s workers are members of the PCS trade union who had voted recently for industrial action on the issue of pay. 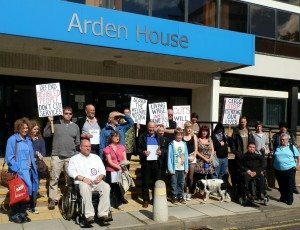 We approached the centre’s manager and offered to organise a public meeting for disabled claimants and their families where ATOS would be given the opportunity to defend their Work Capability Assessment to those affected by it, but they weren’t keen on this idea. Local activists are meeting for a coffee at Newcastle Central Library at 1pm on Saturday 1 September to discuss what to do next. • The medical assessment company ATOS Origin portray themselves as the friends of disabled people through their sponsorship of the Paralympics, while at the same time working with the Department for Work and Pensions to remove more than a million disabled people off incapacity benefits. 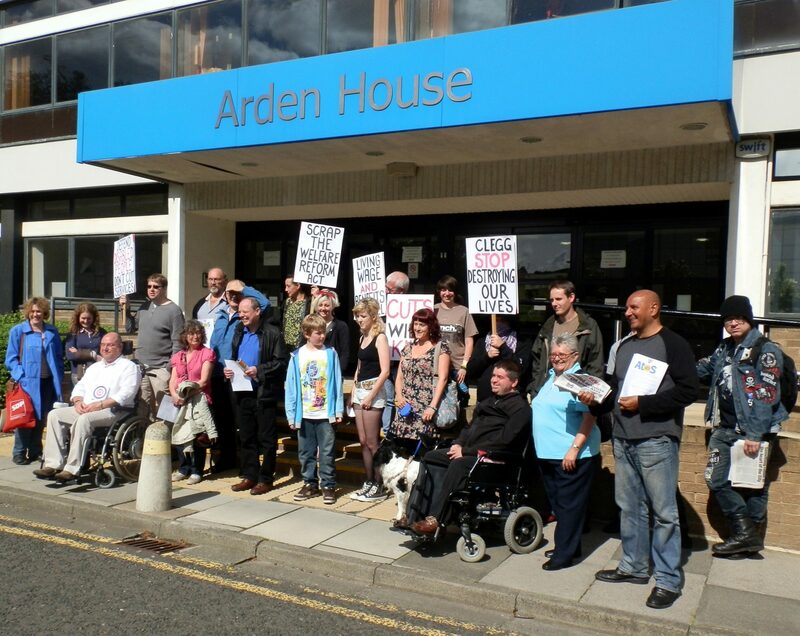 • ATOS Origin’s healthcare division administers a brutal assessment called the Work Capability Assessment that was first introduced in 2008 by New Labour along with the Employment and Support Allowance. • Even young disabled people with life-limiting conditions that mean they will die in their late teens or early twenties have to fill in an intrusive medical form before a decision is taken as to whether they should be formally assessed or not. • 70% of ATOS decisions declaring disabled people as ‘fit for work’ are overturned on appeal where somebody is represented. • Following a unanimous vote at the British Medical Association’s GPs annual conference in May 2012, it is now the policy of Britain’s 44,000 General Practitioner’s to campaign for the scrapping of the Work Capability Assessment. • The right-wing press point to stories of incapacity and disability benefit fraud based on a sprinkling of cases, but they have been quick to forget about the expenses scandal involving the very MPs who voted for ‘welfare reform’. • ATOS Origin has made hundreds of millions from running the Work Capability Assessment for the DWP, and has now been awarded the contract to reassess millions of disabled people for the new Personal Independence Payments. • We call for the Work Capability Assessment and recent Welfare Reform Acts to be scrapped, the DWP’s contracts with ATOS Origin and all private companies to end immediately, and the introduction of a more humane and compassionate welfare system where claimants are assessed and supported according to their abilities and needs linked to policies to create full employment.